From left: FirstBank executives Caleb Navarro, Michael McDonald and Aysha Issa. 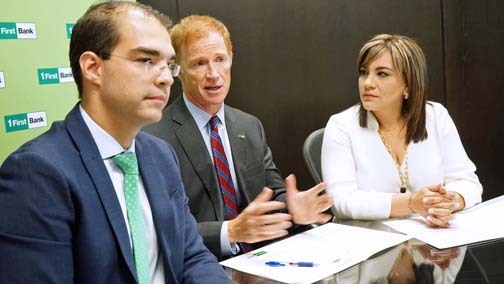 Looking to cater to that high-net worth segment of Puerto Rico’s population who typically expect distinctive banking services, FirstBank officially unveiled its new branch in Condado, which houses its new Platinum Banking service, executives said Wednesday. FirstBank’s corporate division has been “extremely busy” this year, undergoing a number of organizational changes to integrate four business segments under a single division, including large corporate clients with more than $25 million in assets, said Michael McDonald, executive vice president and head of FirstBank’s Business Group division. “This year we integrated middle banking, which used to be part of what was offered at our branches, into the business banking division,” he said, among other changes. A consolidated business banking division offers FirstBank opportunities for “crossed-sales and synergies” to customers. The Platinum Banking service is extended to affluent customers with deposit accounts starting at $250,000. “That segment was basically born out of the Law 20/22 initiatives. Now, we want to offer that same platform to clients who are not in that segment, but that are business owners and high-ranking executives who fit that ‘platinum’ profile,” said Caleb Navarro, first vice president of Platinum Banking and president of FirstBank Securities. Laws 20/22 were drawn up in 2012 to offer incentives and tax breaks to foreign investors looking to do business in Puerto Rico, in exchange for job creation and other economic benefits for the island. The laws drew a wave of prominent investors, including billionaire John Paulson, who has picked up several real estate properties, particularly in the hotel segment. The bank’s high-net worth division had been growing at a pace of between 20 percent and 25 percent annually, and the expectation is to maintain that rhythm, Navarro said. The new 8,000 square-foot branch, which took over the former UBS Condado office, entailed a $1 million investment to rework the layout and now employs 20 FirstBank officials — 12 to offer regular banking services and eight dedicated to Platinum Banking. FirstBank has been a Condado neighbor for more than 40 years and now has two branches in the area, which is part of its growth strategy, said Aysha Issa, first vice president of Personal Banking and Small Business. The new location offers regular banking services, has an ATM machine and a “digital bar,” where customers can use tablets to conduct transactions on site. “Puerto Rico’s economic situation is complicated, but if people understood well the level of capital that banks in general need to have under Dodd-Frank stress test parameters, and our policy of having a high level of capital, they would know it’s more than enough to go through this situation and come out on the other side,” McDonald said. For his part, Navarro said the Oversight Board and now the court need to provide a roadmap for what’s a head to help people feel secure and trust enough to make investments in Puerto Rico. “If investments stop, so does economic growth. If there’s uncertainty, investors postpone their plans and economic activity stops. We have to have a roadmap,” Navarro said. Meanwhile, the executives confirmed that the wave of migration in recent years has not affected deposits. However, the negative side to that is that people are holding on to their money “to see what happens,” McDonald said. Hey Buddy!, I found this information for you: "FirstBank opens ‘Platinum Banking’ branch in Condado". Here is the website link: https://newsismybusiness.com/firstbank-platinum-condado/. Thank you.